Another render of my Resurrection model, set against an excellent background by icLust3R. 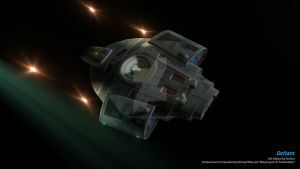 The ship itself was rendered in 3DS Max 9 and saved as a PNG, to preserve the transparent background, and then placed against the background in Photoshop, and both background and render were given some film grain and lens flare effects. I think I did something else as well, but I can't for the life of me remember what I did. Oh well, it looks good, that's what matters. Don't know how I missed this wallpaper last time I was in your gallery. to a Sovereign class and it would look right at home. religious context, could warp first contact from festivities into hostilities. It was a name I chose when I was with a gaming group called the 9th Fleet. We were one of the largest groups/fleets active in the old Starfleet Command series of games, and branched into Bridge Commander. I retired from them a long time ago for my own reasons, but during that time, I had learned kitbashing, and eventually making ships from scratch. I had made early kitbashes of the Resurrection, and they're still around if you look hard enough. Anyway, the name Resurrection doesn't necessarily have to have religious or cultural context. 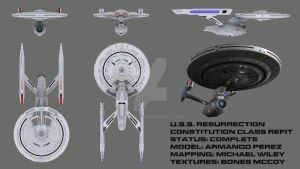 Granted, my own choice for it was partially rooted in my own religious belief and outlook, but also, with what I had done with kitbashes at the time, which predate this version of my ship, the name Resurrection was a perfect choice, if you look at it from the standpoint of bringing a beloved design back to life. In fact, here's a link to the old Resurrection. You can see some of the similarities I kept from my old kitbash when remaking the Resurrection as she stands now. Makes even more sense given your narrative. I did in fact click through to check out the old mesh. Still, no matter what the context the word resurrection is always going to have a *denotative* religious element. Usage as a synonym for simple restoration is a tertiary definition at best, and even then derivative of the primary one. You just can't get away from it etymologically: definitions matter. Given your use of actual paragraphs, I'm guessing I wouldn't have to twist your arm to get you to agree! We won't be making any *real* first contact in Bridge Commander any time soon, so fortunately the question is pretty much moot! Well, twisting my arm is harder than it sounds. I've had many years to think about my decision, but also I'm more stubborn as I'm older now. Some good things about getting old. Me too. :-D Oh, and thanks for the fave! 24th century connie! I like too! Actually, she's 25th. Long story. Oh, and thanks for the multiple favs! Wow! I wish my renders looked this good! Great work! It was luck mostly. The background was done by icLust3R here on DA. I came across it, asked permission to use it, and then just rendered my ship with some lights and saved to a PNG file, that way I could copy and paste it onto the background in Photoshop. Applied a few filters, and magic. I was mainly playing around with the filters. I really liked the results. I'm glad you liked this image. Thank you! WOW! REALLY gorgeous lighting! A beaut! Thanks. I lucked out on the lighting when I rendered the ship. And the effects I did in CS4 kinda enhanced it, and I think blended the ship and the background a bit. Thanks, and thanks for faving this beautiful image. Thanks. I'm very proud of this one. Very welcome! You should be!